Photo by Josh Kling/Western Rivers Conservancy. The Bureau of Land Management (BLM) has made a final decision that will guide future management of BLM administered lands in the Sandy River Basin. In the past 15 years, the BLM has acquired nearly 6,000 acres of public land in the area. Combined with existing holdings, the Salem District now manages 14,850 acres within the Basin. 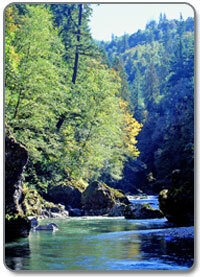 The Sandy River Basin Integrated Management Plan is the culmination of three years of collaborative planning. During that process, the BLM worked with a variety of partners including the private landowners, recreational user groups, U.S. Forest Service, the Sandy River Basin Partners, the Barlow Trail Association, Western Rivers Conservancy, the Department of State Lands and the Oregon Parks and Recreation Department, with the assistance of the National Park Service’s Rivers, Trails and Conservation Assistance Program. A recreation management strategy for the Marmot Dam site and Sandy River-Salmon River confluence that provides river and trail access. Provides an overview of the selected action, and reviews the alternatives considered and provides rationale for the decision. Chapter 1: Introduction and Planning Area Overview describes how the plan is organized, provides a background on the Sandy River Basin and reviews the relevant land use allocations. Chapter 2: Management Issues and Goals describe the issues the plan addresses and establishes goals for management of lands in the Basin. Chapter 3: Management Objectives, Standards and Guidelines outlines management objectives and the resource-specific direction the BLM will use to assess land or resource use activity and will apply when implementing various management practices. Chapter 4: Environmental Effects outlines management actions and an implementation schedule for proposed projects including terrestrial and aquatic restoration and recreation development (recreation sites, trails and management). Chapter 5: Benefits-Based Management Framework discusses the recreational activities, experiences and benefits that are targeted by recreational development and management in the Sandy River Basin. Appendix A: Contains summarized public comments for the Environmental Assessment, which preceded the final Management Plan (released August 2008). Click here for a downloadable version of the EA. Appendix B: Includes Form 1841-I, which outlines the process for appealing the Decision. Individuals have the right to appeal this decision to the BLM, Cascades Field Manager within 30 days and thereafter appeal to the Board of Land Appeals, Office of the Secretary. If no appeals are filed, this decision will become effective and be implemented after 30 days. Appendix C: Includes the Water Quality Restoration Plan (WQRP) which outlines a comprehensive strategy for implementing, monitoring, and evaluating management on BLM lands in the basin to address water quality impairment.